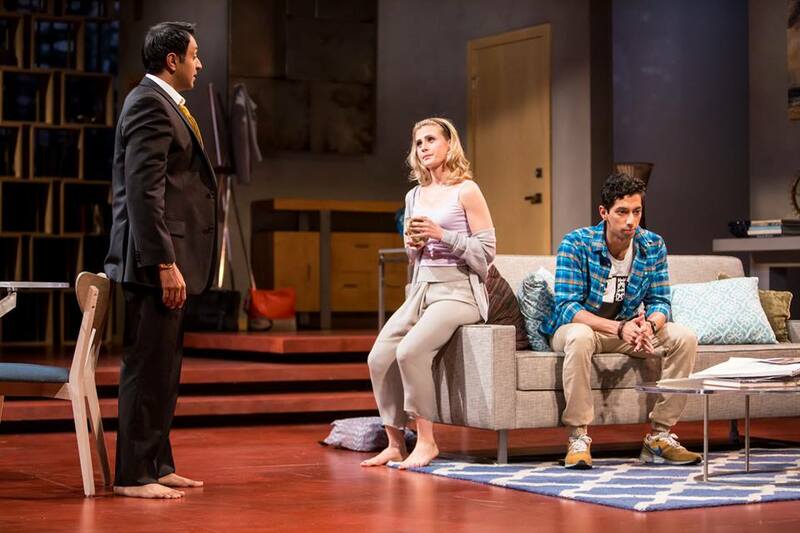 Amir (Bhavesh Patel) is a successful lawyer, living in a posh apartment on NYC's Upper East Side with his artist wife Emily (Caroline Kaplan). He has renounced Islam as a religion and a culture, and even changed his name to Kapoor, not correcting people when they assume he's Indian. When his nephew Abe (Adit Dileep), who has also changed his name, from Hussein, asks Amir to help an Imam who's been arrested for allegedly raising money for terrorists, he doesn't want to get involved. Emily convinces him to do it as a favor to her and his nephew, and the consequences of "outing" himself publicly as a Muslim are greater than either of them anticipated. 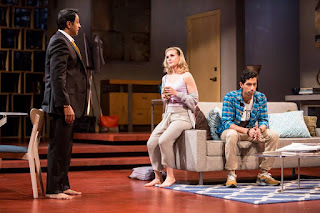 As this crisis is coming to a head, Amir's coworker Jory (Austene Van) and her husband Isaac (Kevin Isola), a gallery owner who's interested in showing Emily's work, come over for a friendly dinner party. Which turns into the worst dinner party in the history of dinner parties; they don't even make it past the salad course! These two couples, comprised of a Muslim man, a white woman, a black woman, and a Jewish man, seem to really like and respect each other. But things take a dark turn after a little too much alcohol, combined with the stress of career and personal issues. That's when their true feelings, or perhaps the things they've been taught since childhood ("You've Got to be Carefully Taught," as we learn from the show across the lobby), come out. The most hateful vitriol is spewed, coming from all sides, culminating in a confrontation from which these people will never recover. It's the kind of confrontation that makes the audience flinch in its harshness, but in a way it's cathartic to get it all out in the open so it can be addressed. The characters in this play are not better for it, but we are. The 90-minute play is really well-written, sharp and smart and even funny on occasion, cutting right to the core of the issues at hand. Director Marcela Lorca has added some interesting movement before and between scenes, and does a great job with this incredible cast of mostly non-locals (except for our always wonderful Austene). All of the actors beautifully bring these flawed characters to life, each of whom you at times hate and at times empathize with. None more so than Bhavesh Patel, who covers the entire range of human emotion from desperation to dejection to rage. On a more superficial note, I was struck by the beauty of the set design and the wardrobe. The crisp, clean, modern NYC apartment is exquisitely rendered, and goes through a quick and efficient transition towards the end of the play. 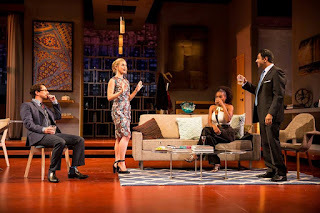 Each character's wardrobe tells us exactly who they are: Amir's expensive and conservative suits, Isaac's more eclectic matching of patterns, Abe's college kid gear, Jory's stunning dinner party outfit, and Emily's entire collection, from comfy chic to artist trendy work wear to cocktail dress (set design by James Youmans, costume design by Ana Kuzmanic). 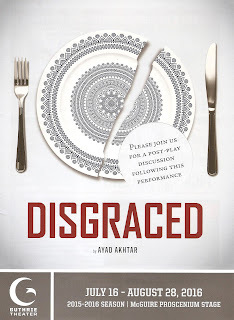 Disgraced and South Pacific create a really interesting pairing. While the tone of the two shows couldn't be more different (a shatteringly intense five-person drama, a beloved and lush huge-cast musical), both deal with similar themes of prejudice, identity, and how we deal with the "other." In a note in the playbill, Guthrie Artistic Director Joseph Haj writes, "By putting these two vaunted scripts in conversation with each other - the searing play and the grand musical - my hope is that a vital question might be considered by all of us: from 1949 until today, how far have we actually come in the ways we view and talk about difference - differences of race, religion, and identity?" What I love most about theater is learning about people, places, and experiences different from my own, and hopefully thereby expanding my understanding of the world and my fellow citizens. 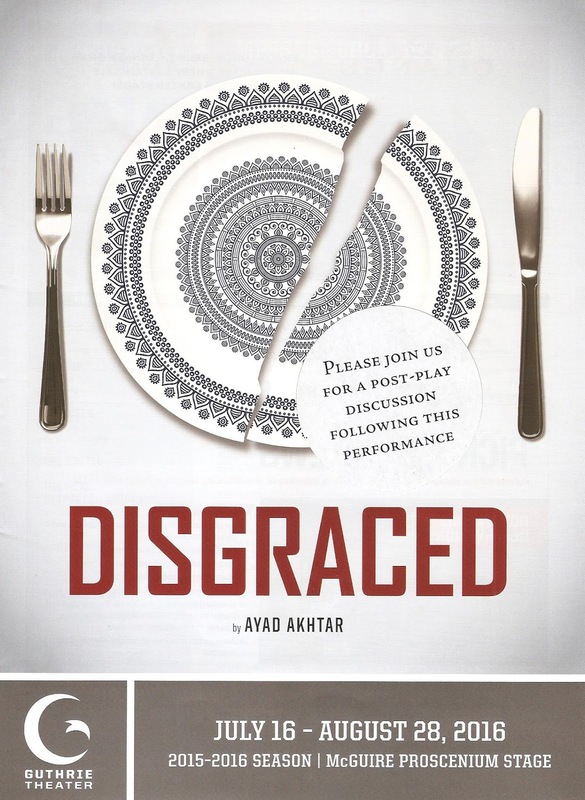 That's something that Disgraced does brilliantly (playing through August 28).